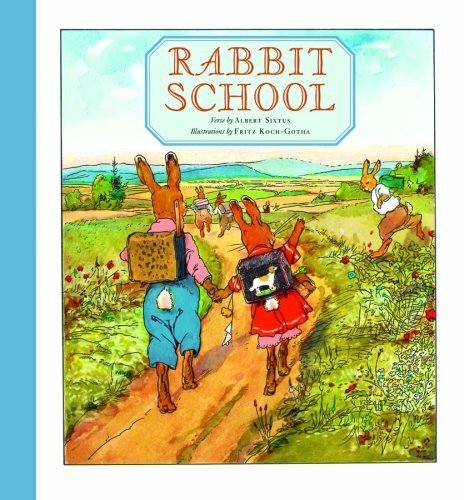 If you are of a certain age, you probably had a storybook about a Rabbit School on your bookshelves as a child. 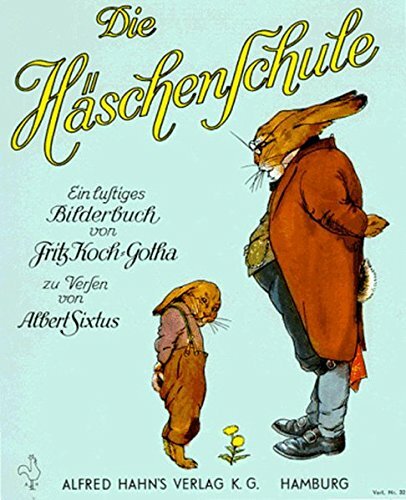 In 1924 Albert Sixtus published a book about a bunnies going school called Die Häschenschule. 95 years later, this classic book is still charming children all over Germany. 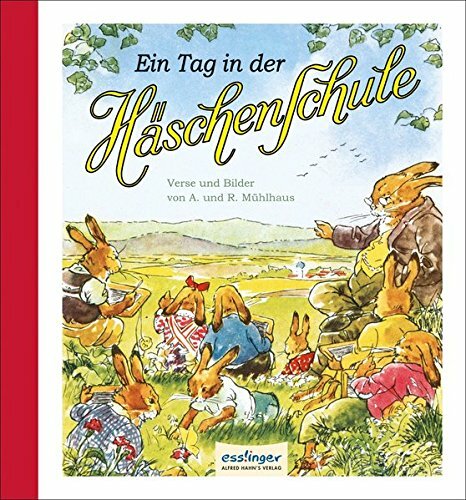 For Easter in 2019, the Esslinger Verlag (Esslinger Publishing company) is publishing a special anniversay edition of the book that brought color and hope to children in a country that had been destroyed by war, and a whole new generation of children will get to read the stories of how Hasenhans und Hasengretchen learn to be an Easter Bunny. And now, the book is available in English as well! Albert Sixtus got the idea for the book while playing in the garden with his son who was about to start school. 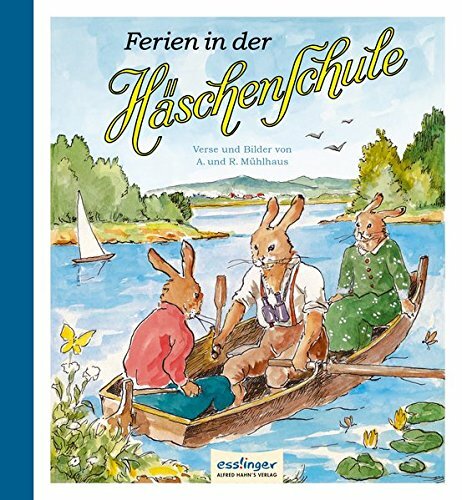 At the time, primary school in Germany began at Easter time, and not in the Fall, so it made perfect sense to write a book about what it’s like to go to school, and tie it in with a Bunny and Easter Theme. What is Die Häschenschule? It was where all good Bunnies would go to learn everything a they needed to be a good member of Rabbit society. All the important subjects were taught… good manners, how to identify plants, how to paint Easter Eggs, and how to elude the Fox and other dangers found in the woods. 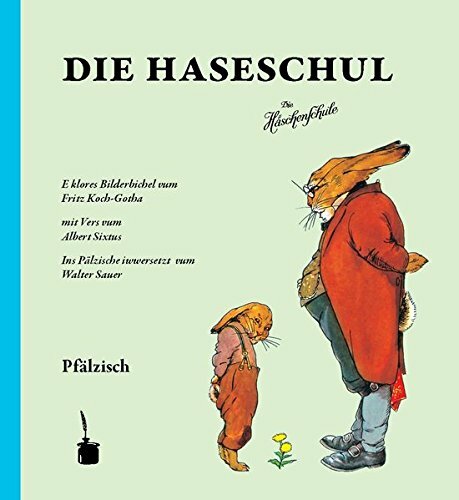 Like so many German Language children’s books, Die Häschenschule is written in rhyme. But even though there were many “lessons” to learn, Albert Sixtus, a rather liberal school teacher, used a much more gentil approach than previous German children’s authors. The illustrations drawn by Fritz Koch-Gotha delighted children with their bright colors and fantastic detail. Little boy bunnies in knee pants, girl bunnies in dresses with aprons. All happily headed off to school hand in hand wearing their school back packs… noses cleaned and hands washed! “putzt noch eimal die Nase! Nehmt nun Tafel, Stift und Buch! Tunkt auch eure Schwämmchen ein! with a cabbage leaf handkerchief! Take your blackboard, pencil and book! 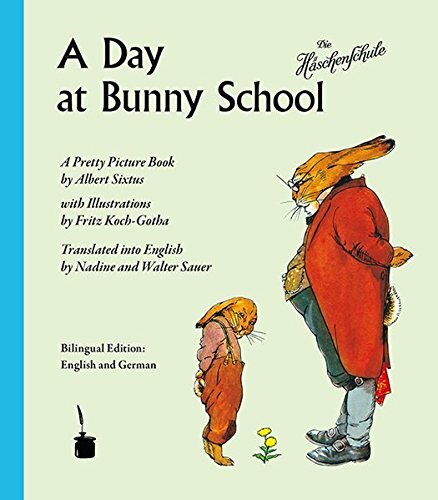 Bunny parenting was still strict, and Rabbit teachers still punished, but this book was more about sending bunnies to stand in the corner than beating them with a stick. The Häschenschule Teacher was a kindly old Rabbit in a morning coat, glasses, and long ears, who looked kindly at his students. Students sat at desks with benches and learned their lessons well. 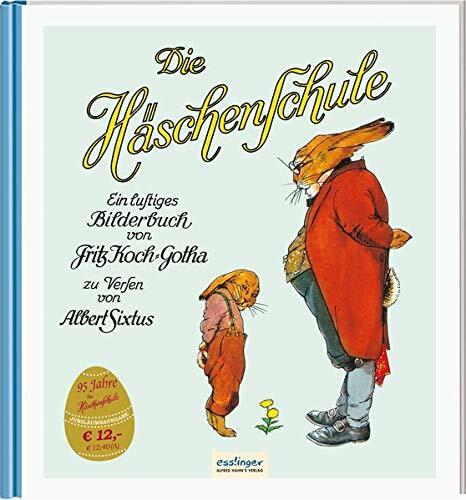 Die Häschenschule was book that taught children ABOUT school… what was expected of them, and how they were to behave. They had to come clean, and have supplies. They must sit in rows. And if the teacher asked a question, they must raise their hands to give the answer. 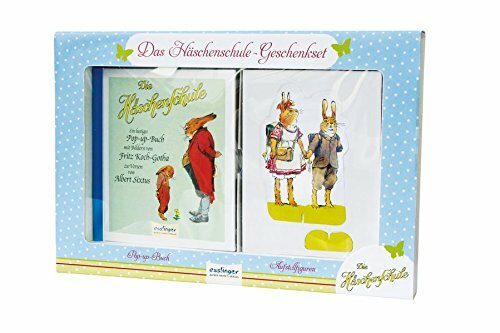 müssen sie die Pfötchen heben. And so on the book goes through the day each hour described in rhyme. Bunnies got to paint eggs and garden, lessons were given on how to stay away from the Fox, and how to escape from hunters by zig zagging in the woods. The teacher pulled out a violin, and the bunnies even had a music lesson. Then it’s time for the bunnies to go home and have their mid-day meal. And they eat every bite of their veggies! 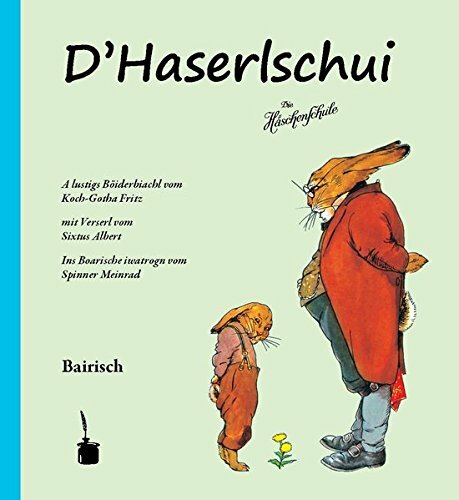 Die Häschenschule is available in the original German, in a bilingual German-English Edition, and in English. The book was originally written just after the first World War, when life in Germany was pretty bleak, and it opened a colorful fantasy world for children. Today, parents and children are re-discovering the magic in the story. A world without computers or cell phones, when kids still Hide and Seek outside in the fresh air. A magical place that we sometimes all want to drop back in to. In 2017, Die Häschenschule was turned into a movie called, “Die Häschenschule-Jagd Nach dem Goldenen Ei”. Sadly (to me) they use updated animation techniques which change the feel of the story. It’s completely modernized. Still, maybe this film will introduce the school to a new generation of bunnies. 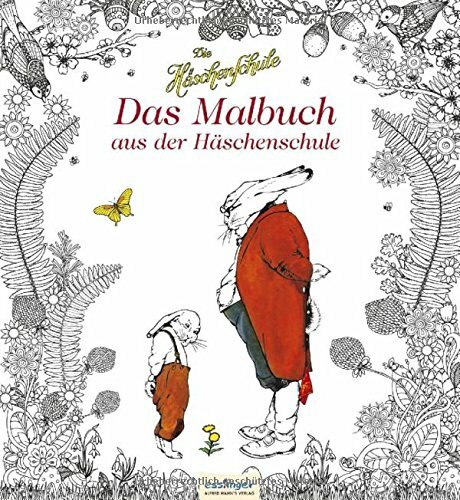 You can also find further adventures of the Häschenschule (written by other authors.) Cookbooks, Easter Stories, Gift Sets, and even Motherly Knowledge! It’s even possible to buy the book in German Dialects! Albert Sixtus was born in 1892 in Hainichen, Saxony. 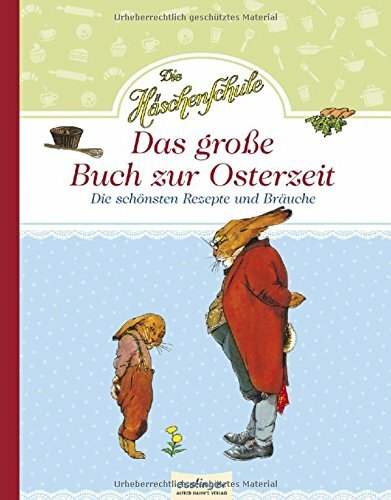 He wrote over 70 childrens books over his career including Knecht Ruprechts Weihnachtsbäckerei , Der Zuckertütenbaum, and Der Häschen-Schulausflug. 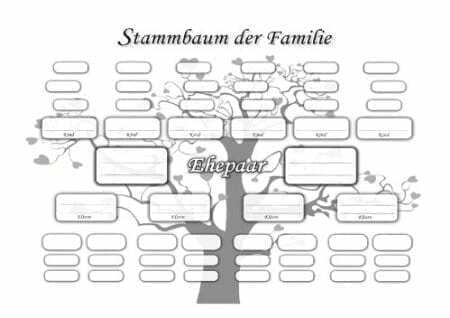 From 1936 to 1943 he contributed to the Auerbachs Deutscher Kinderkalender, an annual collection of stories, poems and games for children. This is where Albert Sixtus got into trouble with the Gestapo. In 1935, the publisher of the Annual released the book with a new cover. Suddenly it was brown with a Hitler Youth motif on the front. Sixtus was instrumental in changing it back to the old red cover. He refused to allow the National Socialist propaganda get into the Kinderkalender. He spent the rest of the 30s, and much of the war under intense government scrutiny, and was even arrested for a few days. Many of his books were either destroyed or banned from shop displays. Despite this, he kept writing for children, and was a corrosponding Uncle during the War… spending hours every day responding to children’s letters. After the war, he never was as prolific again. The wartime death of his son, and his own WWI injury which caused him constant pain took everything out of him. In 1956 his book Die Häschenschule was translated into Swedish, and his career made a bit of a come-back. Because he lived in Jena, in the DDR, the only way his new books could be published in the West was under the name of his former student Karl Felix von Schlichtegroll. He died in 1960 before seeing his own name on a new book. I love this quote from the Albert Sixtus Website. I can just see him, looking just like every child’s favorite grandfather. 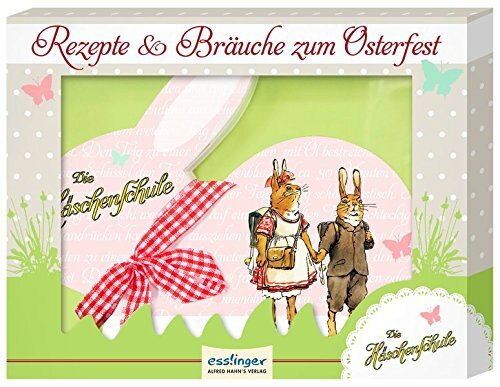 German Easter Story Books For Kids- Perfect for Easter Baskets! 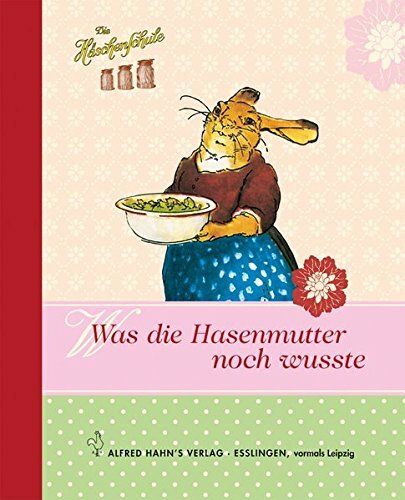 Your Favorite German Children’s Books, in English and German! next German Easter Breakfast- The BEST German Breakfast of the Year!